The Bainbridge Market | What’s going on? The Bainbridge Island Real Estate Market is a small market. A niche market. I know when I moved here I could have represented myself as a licensed agent, but I knew, as a buyer in this small market, that I needed an expert, local opinion. Someone who knew the market intuitively. When we bought we bought in a very similar market of today. It was 2007 and prices were high. In the end, we bought solely for location (in Winslow, walkable to the ferry) and when the market crashed in 2008, we were so glad. Even in bad times, the homes in solid, core locations did sell. In other locations you could not “give them away,” as we say in the real estate business. Right now, in 2016, we are in a seller’s market again. Prices are rising and the inventory is very low. The graphics below illustrate our lack of inventory and we are seeing many multiple offer situations when homes come on the market. The mode of operation here is that 90 percent of agents list homes on Wednesday and then review offers the following Tuesday. That gives buyers from near and far the chance to see the home. A small number of agents list homes on Friday and take offers as they come. Some speculate that those agents do that in an attempt to double-end the sale (represent both the buyer and the seller) by finding a buyer over the weekend at an open house. By the way, at Windermere Bainbridge, it is against our office policy to represent both sides of a transaction. This is an age-old debate in real estate, but as an office, we collectively feel we can not ethically represent both parties. I whole-heartedly agree. 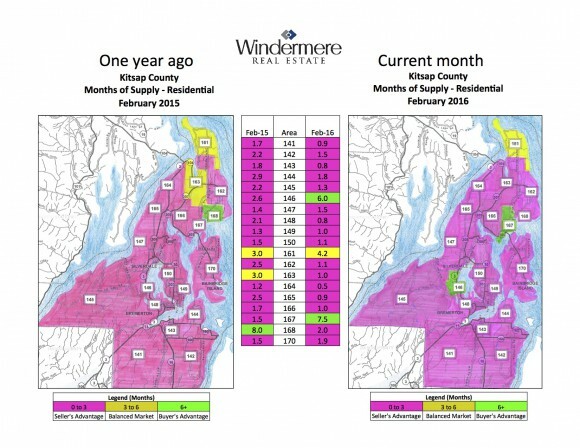 The Bainbridge Market is ‘170’ we currently have 1.9 months of available inventory. Under three months of inventory equates a seller’s market. We are indeed there. Since there are so may multiple offer situations going on we are seeing diverse pricing strategies. Some agents/sellers will list a home far under market value to see WILD escalations, 10% plus for some homes. Many agents/sellers price at a compelling price right below market value to insure an offer or maybe two. The agents who are pricing extremely low are seeing 5 or more offers. My buyers are trying to figure all of this out. They rely on me to gauge the strategy and pricing they see. After almost ten years of selling here on the island, I intuitively know if a home is priced at market value or well below. And I can show clients comparble sales to help them see it too. This helps my buyers know if they will get priced out of their budget/comfort zone, or not. And it helps helps them gauge where to realistically end their escalation clause (as many buyers are opting to use them). Last year at this time, we had 1.5 months of available inventory, versus the current 1.9. available. Yet the real pressure out there in the market is more intense. My theory as to why – more buyers are in our marketplace this year, versus last year. Those buyers are interested in the “good” solid homes and are making offers on those homes. The overpriced homes or homes in the weaker locations, are sitting. 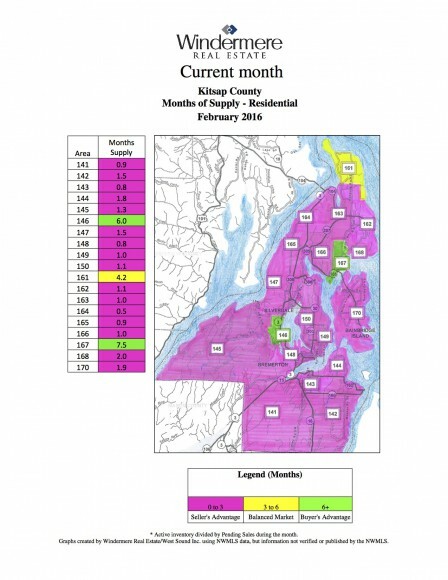 Our inventory is actually a tad higher than last year at this time, yet we are seeing more multiple offer situations. What this graphic does not show is the increase in buyers to our market. There are more, believe me. My buyer-client load is up about 30% from last year and I know I am not alone. Again, I hope the inventory continues to come on to keep up with our ever-present buyer demand. We still see many Seattle agents coming over with buyers. As listing agents we secretly love them because they quite often help their clients over-spend on homes. Their barometer is set to Seattle Market pricing and they go wild over here and many times it is unnecessary. Yes, they are winning multiple offer situations, but I just cringe when I see some some of the closing numbers, especially for homes in areas that are not strong. In short, as a buyer, be well educated before entering into a multiple offer situation and wherever you are buying (or selling), use a local agent.